Professor Leslie Michael Croaker Ralph is the Owner and General Director of the British Bookstore, a specialist dealer and purveyor of British books in the Mexican and Latin American region. With offices and warehouse located in Mexico, the firm acts as a provider of books to schools and colleges across the region, as serves as a prime resource for English Language books for the academic community. With over 18 years of experience in importing of books, Prof Leslie is a recognized expert in Anglophone matters and regularly communicates directly with publishers and other business contacts to facilitate his operations and procure the best possible material for his clients, at the optimum cost. Through The British Bookstore Prof. Leslie also acts as representatives of British Publishers in Mexico and Latin America helping British companies to reach the vast potential markets in the region. Offering not just academic books, but a treasure trove of British travel guides, biographies, children’s literature, classic, historical literature, structured reading material and non-fiction, Prof Leslie carefully curates the British Bookstore’s collection to ensure they provide the best in British books to suit all needs and tastes. Able to import from all major UK publishing houses, he can procure for his clients most UK titles that are currently available on request, including ones not generally distributed internationally. With a PhD from the University of the Americas in Neuro Linguistics and a MA in Business Administration Prof Leslie is a member of the Society of TESOL (Teaching English as a Second Language). 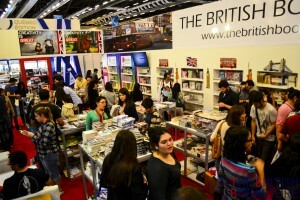 He represents the store each year at the FIL Guadalajara Book Fair, the Largest Book Fair in the Americas, where his festive British-themed stand is a popular annual feature. A pillar more than just the academic community, but of his local community as well, Leslie often conducts free seminars and appears at conferences throughout Mexico and Latin America. In his spare time, he enjoys oil painting and listening to jazz music. International Society of Business Leaders Member Leslie Michael Croaker Ralph, PhD can be found on the Society Directory, where he is looking forward to networking with you.